making: ROBYN'S FETISH CHALLENGE # 320 "CHILDREN AT PLAY"
Good Day to everyone no matter what time it is when you are reading this post. Hope you had a great weekend. I have been putting the finishing touches on the room that my husband and I remodeled to put my scrapbooking stuff and other crafts that I work on. It's not as big as I really need but my mother-in-law is moving in with us and she will be taking my big room I was going to use. You have to do things differently when it comes to family. I do have more things to do on the room but I need to get everything out of the other room because she is moving in at the end of the month. Now I'm going to move along to our new challenge of the week. Our sponsor for this week's challenge is A Day For Daisies. I would like to show you the card with the image "Wall Art" that I used from A Day For Daisies Store. I call it "The Writing Is On The Wall." A Day For Daisies is giving the winner of this weeks challenge "Children At Play" projects this prize. I really found this image adorable. I remember my children when they were little writing on the walls of their room. Couldn't just wash it off. Some of it had to be painted over. I was grateful when they grew out of this stage. 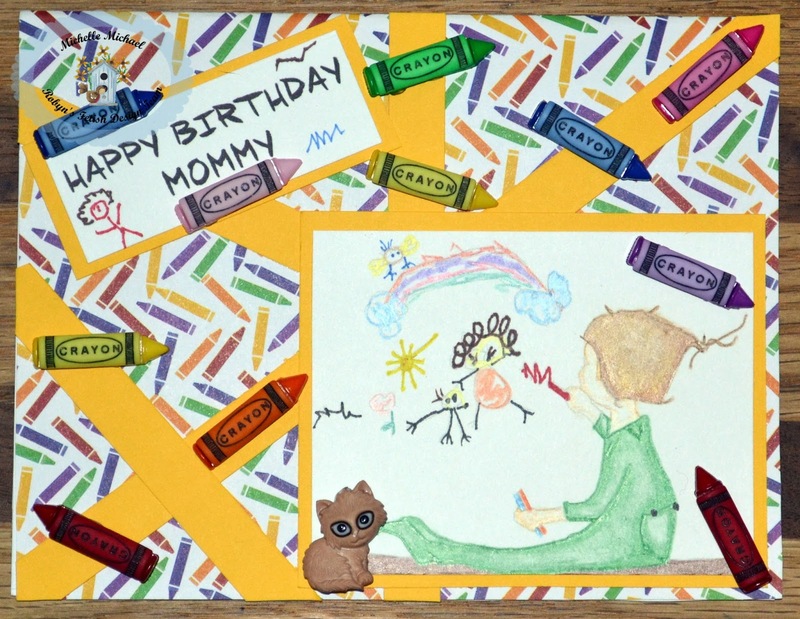 Since this was obviously a toddler I wanted it to be a Birthday Card from the toddler to his mommy. I colored the wall to make it look like a wall that a toddler drew on. I made the mistakes on purpose. Since he was using crayons I found this great paper and had embellishments to go perfect with it. I tried to find a teddy bear that a toddler would carry but I couldn't so I just put a cat that sits beside him. I found this great font that kind of looked like a child's writing. I really think it turned out great. I hope you do also. Here are the items I used. I want to Thank all of you that has been here and read my post. Really hope you find inspiration from this to make your "Children At Play" card. Then when you finish, go to Robyn's Fetish Challenge Blog and enter. All the rules are on that page and you can also see what the other design team members made. Hope you have a Great Week ahead! !